Over 50% of our customers are residential homeowners working on various projects around the house, including: Cleaning out your garage or attic, yard waste, moving, remodeling or DIY renovation, or any project that will generate an excessive amount of trash. Our residential roll-off dumpsters provide homeowners with the most economical option for trash and junk removal. 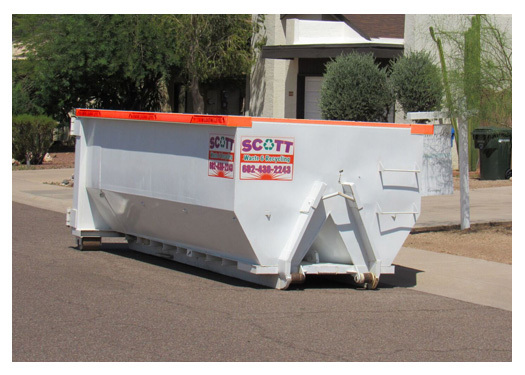 Family owned and operated for over a decade, Scott Waste Services is Phoenix’s premier roll-off container provider. You can expect prompt, affordable dumpster service and excellent customer service. We do what it takes to meet the diverse needs of our clients – you’re not just a number at Scott Waste! Renting a dumpster and loading it yourself is the cheapest way to remove your unwanted trash & debris. Ready to order your Dumpster? Book Now! Yards: Limbs, fallen trees, overgrown shrubs, old swing sets, grills and general yard junk.